And then they came for the cows. But I had no cows. Let me offer a suggestion as to why there are 200 armed agents harassing a rancher in Nevada: our dear leader has not had the blood necessary to execute his Crisis-As-A-Means strategy to disarm, then overthrow, America. Crisis-As-A-Means is how it is done. Lenin had WWI. He negotiated out of it (poorly) in order to bring the troops home... to fight the internal enemies in a civil war. Stalin needed an enemy to start his terror, so he manufactured a terrorist hit on one of his top leaders (who was getting a bit uppity btw), Kirov. Putin is rumored to have blown up an apartment building in Moscow prior to his early election to President, as he was the preferred candidate to get tough on the Chechens. These three examples, and there are many others, led to massive death. Obama has had more blood than most. The Aurora theater shooting, Sandy Hook, Ft. Hood I, Ft. Hood II, etc. His disarmament efforts have failed for two reasons: 1) the Constitution, while in tatters, still reigns, and 2) Obama's massive communist inspirations do not match his inferior abilities. It is not just us on the right who say America elected an incompetent as president. But time is still on his side. It is quite depressing to think what he has already accomplished, although most among us are still fooled. What I'm about to say will anger some of my like-minded comrades. Until I hear differently, this is my opinion. The Bundy rancher story is smack dab in the gray zone. It is not black nor white. But that is where the comparisons end. The ranchers were denied the use of BLM land after having had permission to use it. Long ago. They didn't stop using it. This has been going on for many years, including during the Bush years, and the ranchers have forced the government's hand. Yes, the government chose to escalate to today's armed standoff, and the escalation could lead to the loss of human life. If it were my land, I'd escalate. I expect a government "of the people," however, to show more discretion. More restraint. More respect for life. I agree, this government is not "of the people." I humbly bow to those who are in the area to disrupt this government action. "Dissent is patriotic," we were recently told. That rule still applies. 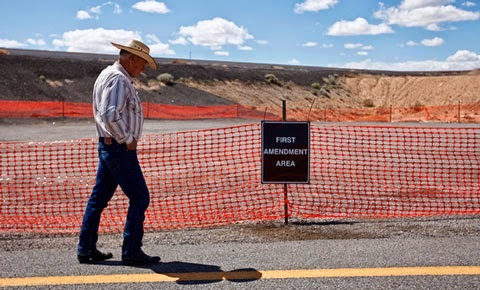 My suggestion for that First Amendment Area (seen above with rancher Cliven Bundy) is to stage harassing drone activity. Visit those sniper teams with camera-fitted drones so America can see the future. Those are my thoughts at the moment with the information I've seen. Ann Barnhardt shares her warning. Western Rifle shares many links. Sipsey Street critizes the NV governor. III Percent links to the ranchers' website for their side. Mr. B. asks if you will stand down as you (we) did at Ruby Ridge and Waco. He reminds us here that this is all about control. 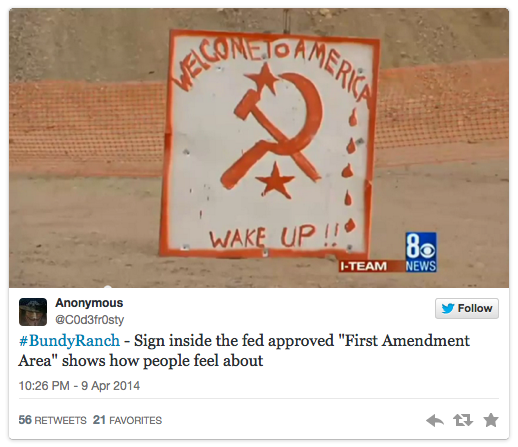 WZ shared this tweeted photo, taken withing the First Amendment Zone. How appropriate. More photos and videos at this link. 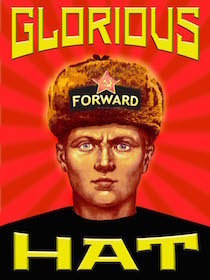 And Mark Steyn shares: The First Amendment is Not an Area. Wild Bill, retired US marshal, reminds the officers of their oath. Thanks for the links back! Western Rifle and III Percent Patriots. Both have more recent posts on this story. While I agree with you that this is neither black nor white, it is ultimately, as you point out again, about control. Do not forget that in the adjacent areas, there is a significant overpopulation of wild horses and burros...more per square mile than there are cows on the disputed acreage. But the BLM has failed to do anything about these horses and burros, even though they are just as "bad" for the "endangered" tortises. You up for a road trip? We can share gas and driving to get there. We can use my car (or my truck). "Capitalism is a social system based on the recognition of individual rights, including property rights, in which all property is privately owned." My guess is, many who find this latest incident alarming hold contradictory ideas about the fundamental nature of the issue. My guess is, most who argue that the federal government is violating individual rights also believe the federal government should "protect" some land "for us" like Yellowstone, for example, and not "let" any individual build their lives on such lands. Where in the Constitution does it say we the people want the federal government to control all the pretty places for posterity? Until we recognize and fight for our rights fully (through persuasion until that too is banned) as Ayn Rand does in the quote above, we'll have to fight on an acre by acre basis. I disagree with Ann Barnhardt's assessment. She takes it as given that the federal government must be paid for grazing cattle on land it claims to control because "there's no free lunch." She's conflating what nature provides with what government "provides". The King's Forest has to go. Mr. B, I've been waiting out in front of my house for two days now waiting for you to pick me up. We have to get our codes back in sync. I'm on one-time pad #47B. Thanks for the comment, Comrade Mo. Yes, many details in this story that make it both unique and unclear.